Torrent Engineering & Equipment believes that when our client purchases an automation system, it should be designed to last and be easily supported by the client’s inside maintenance personnel or their local subcontract service center. It should also be easily expandable and the software should be capable of communicating with the many PC interface tools now available. This is why we utilize standard industrial Allen-Bradley Programmable Logic Controllers (PLCs) in our PLC pump, compressor and cooling control panels. They are the most common and serviceable PLCs found in the marketplace, and parts can be purchased in almost any area of the world. Our TorrentLOGIC™ software for pump control systems has many years of development and proven installations behind it. 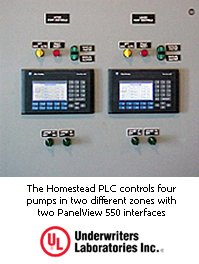 Torrent is a UL (Underwriters Laboratories) Certified 508A Industrial Controls Panel shop.